This is probably my most from-the-heart article about my favourite cafè and bakery in Budapest. 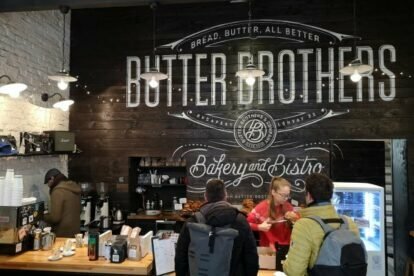 I wasn’t surprised at all when after joining the Spotters, I found it already on the map — Hélène, our French colleague had written about it and when she decided to leave, I asked immediately to adopt Butter Brothers, which is the best bakery in the city by most of the locals too. Not only because ‘the croissants are almost like in France’ (according to Hélène) but also all the other pastries are super delicious, made with lot of butter and, truly, love. Try here the typical Hungarian sweets kakaós csiga (chocolate roll) or túros táska (pastry filled with sweet cottage cheese) and drink a perfect specialty coffee on the side. Although Hungarians consume loads of bread and pastry, good quality bakery stuff is still rare in Budapest. The secret of Butter Brothers is simple: they use real butter instead of palm oil, no additives, the best flour of the country (the same as Pizza Manufaktúra) and they leave out all of the tricks which still haunt Hungarian shops. Sorry, I just can’t help talking in superlatives, since this is such a place which turns a busy neighbourhood of a capital into a cosy little town where you just simply lean your bike against the wall without a lock. If you come in the morning, you have a great chance to meet me there while I’m having my beloved flat white.